A clean kitchen is a happy kitchen. As I spend most of my time in the kitchen, I like my kitchen to be clean. I enjoy cooking only if my kitchen is clean. The kitchen sink is very important and should be not be ignored. It should be kept clean to prevent bacteria growth. As I am allergic to chemical products, I avoid using harsh chemicals for cleaning purposes. I use vinegar, baking soda, lemon and salt for cleaning purposes. These are eco-friendly, non toxic alternatives to harsh chemicals. Find methods and tips on how to clean a stainless steel kitchen sink. First rinse or wet your stainless steel sink with water. Sprinkle baking soda (or cooking soda) all over the sink. (Baking soda is a natural cleanser). Then add 1-2 tbsp of white vinegar. Spread it all over the sink area using a nylon scrub or any non abrasive scrubber. Do not rinse the sink. Take 3-4 drops of dish washing soap in a scrubber and scrub in a circular motion all over the sink with little water. Using an old tooth brush, scrub the holes of the sink drain and tap/faucets. You can also rub a used lemon peel and clean the tap. Then rinse the sink and the tap thoroughly with plenty of water. Finally wipe the sink with a dry cloth. Keep your sink dry when not in use to prevent water marks and rust. 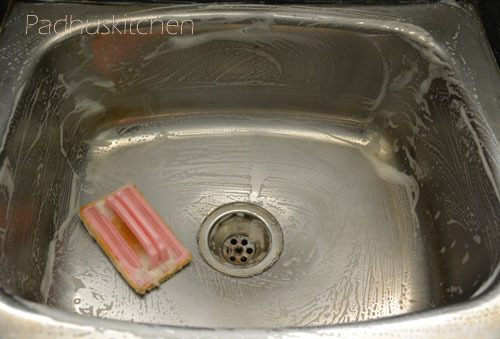 You can do this once in a week or once in 15 days depending upon the condition of your sink. 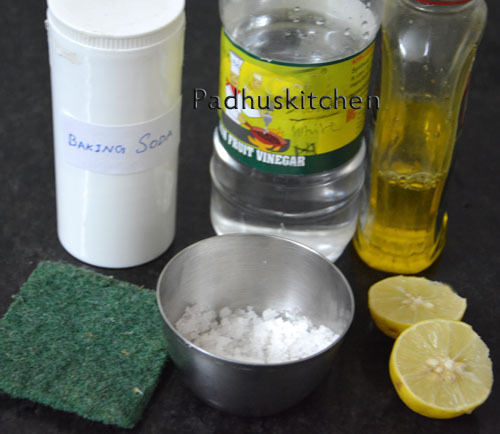 If you do not have vinegar and baking soda at home, clean it with lemon and salt. Instead of vinegar and baking soda, use equal quantity of lemon juice and salt and follow the same procedure above. Mix equal parts of lemon juice and baking soda together. Rub the mixture on the area, leave it for 30-40 minutes and then scrub using a scrubber. Rinse thoroughly with water. Do not use steel wool for scrubbing as it will leave scratches. Never leave dirty dishes in the sink. If you feel lazy to wash the dishes immediately, you can put it in a plastic tub and leave it outside the kitchen. Clean using a few drops of dish washing soap and a scrubber. Rinse it well with water and wipe it dry with a soft cloth. Thanks for sharing, I am allergic to chemicals and your method very useful for me to keep my sink clean and tidy.